As I noted in my review of our meal at Yunkun Garden a month and a half ago, Chung King was for a very long time our go-to place in the SGV for Sichuan food. This was until we inexplicably switched our loyalties to Yunkun Garden a couple of years ago, since which time we hadn’t been back to Chung King. As I try to trace the timeline of this switch this I think it might coincide with our first trip to LA with both our boys, not too long after the second was born. I suspect that at that point the 20 minutes of total driving time saved by going to Yunkun Garden might have trumped nostalgic loyalty–especially as Yunkun Garden is as good as Chung King. Well, on this trip, with our boys hanging out at my mother-in-law’s daycare till 1.30 each weekday we had more flexibility, and so decided to return to Chung King. Fascinating stuff, I know. We went to the location in San Gabriel, which is where it moved some 5-6 years ago from its original location on Garfield in Monterey Park. I think the successor which carried on in the original location with the same name and menu and even the original’s reviews on the walls (fooling many people in the process) is still there; as it happens, they were very good too on the couple of occasions we ate there before we realized they were not the same people. Anyway, the San Gabriel location is somewhat off the beaten path, and there were no more people there at weekday lunch than there used to be prior to our defection. Given the high turnover rate in the SGV I assume this means they still do very strong business at dinner and on the weekends. The food was certainly still very good. …and fried peanuts with dried anchovies. All were excellent, and I really liked the kelp which was far more tangy than the version at Yunkun Garden. Bean curd sheets with chives. The pleasures are 75% textural, but the 25% that comes from the chives and dried chillies and the subtly nutty bean curd are crucial too. This may have been my favourite dish and a lovely counterpoint to the hot dishes. Sauteed broad beans. Plump broad/fava beans that tasted (and smelled) a little fermented and funky. I liked it but I don’t know that I would order it every time. Crispy cubed chicken with hot pepper. This was always one of my favourites at Chung King and this was as good as it’s ever been. Boiled fish in hot sauce with tofu. Sliced fish in a lot of chilli oil with cubes of soft’ish tofu. Wonderful stuff that makes you sweat from every pore in your scalp. All of this came to about $55 all in. When you factor in the leftovers we took home that probably works out to about $9/head. In Minnesota a meal about 80% as good will cost more than twice as much. At least, 80% as good as this is still pretty good. 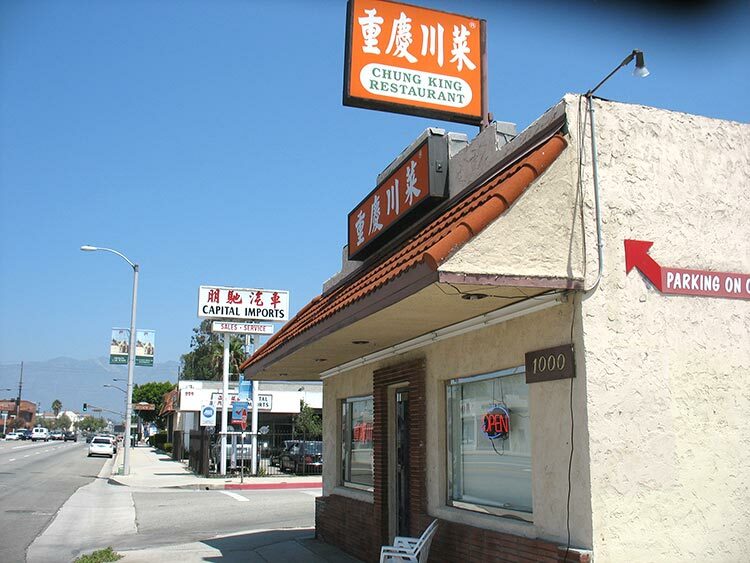 On Chowhound, of course, Chung King is said to have been in decline for a while. But you’re nobody on Chowhound if you’re not constantly finding old stalwarts to be in decline while other people still like them. On the other hand, we doubtless have some degree of bias as well as we’re probably disposed to still like the places we liked before we left L.A. At any rate, my active food forum days are long behind me (and Chowhound was never my scene anyway) and I’m far less driven than I used to be to eat at the latest/greatest. Our evidence from last week is that Chung King is as good as Yunkun Garden, and Yunkun Garden gets good reviews from everyone–to some degree, at least, probably because it is (relatively) shinier and newer. We’ll go back to both next summer. This entry was posted in *Food, Los Angeles and tagged Chinese Cuisine, Chung King, Los Angeles, San Gabriel Valley, Sichuan. Bookmark the permalink. I’ve never noticed any decline at Chung King. It’s remained my Sichuan go to for years, and the bean curd sheets is one of my favorites (along with the boiled fish and lamb with pickled peppers).